Tucker & Dale vs. Evil has little evil at first; or rather, it sets up a situation with no good reason to expect it. Tucker and Dale (Alan Tudyk and Tyler Labine) are two kindly small-town folk who eagerly drive deep into the woods for a much-needed vacation at a crumbling cabin that was sold cheap since its old inhabitant was allegedly some kind of crazed criminal. While out fishing one night, they’re startled by the sight of a pretty young woman (Katrina Bowden) preparing to swim. She’s just as startled as they are, so she ends up falling and hitting her head. Tucker and Dale rescue her and take her back to the cabin to nurse her back to health. What these two nice guys don’t realize is that her friends are under the mostly false impression that she disappeared into the woods and was kidnapped by killer hillbillies or psychotic rednecks. The group of college kids she left behind plots to rescue her, but in the process creates only more and more misunderstandings. A particularly snotty frat boy classist (Jesse Moss) takes the lead and convinces one kid to sneak up to the cabin. As he does, Tucker is preparing to operate a chainsaw but instead gets attacked by a swarm of bees. So, around comes Tucker running with a chainsaw and flailing wildly, spooking the kids and reinforcing their preconceived notions. Oh, and the kid who was sneaking up ends up running in such a blind panic that he impales himself on a tree branch. The college kids think they’re in a horror movie. After all, they’re on vacation camping in the woods and are all of a sudden in danger from the wilderness and from Those Who Are Not Like Them. It’s creepy to begin with, but scary stories around the campfire suddenly have suddenly appeared to become real. The audience, however, is in on the bloody joke. Tucker and Dale just wanted to have a nice weekend and are suddenly confronted with crazy kids running around, acting unexpectedly hostile, and getting killed in freak accidents. Tucker and Dale are the sweet innocents being terrorized. The college kids are the unwitting victimizers, the misunderstood monsters, hurting mostly themselves while making things very strange for these two nice guys. Tucker & Dale vs. Evil is a 90-minute riff on its central genre flip. First time director Eli Craig, who co-wrote with Morgan Jurgenson, keeps the energy high, reveling in his neat little trick of a plot in a knowing way. Wacky bloodshed is the name of the game, held up by an endless string of sudden surprises that show up out of the inherent inevitability in its double-barreled structure of miscommunications. Neither group can clearly understand what the other is up to simply because they are viewing the world as filtered through horror films and socioeconomic assumptions. The college kids are convinced that they’ve encountered kin of Leatherface or Jason. Tucker and Dale think they’re being terrorized by a suicide cult. They’re staring at each other across an artificial social divide. It’s not exactly a one-joke movie, but that’s not far off. It has only one approach. It sets up innocent situations with potential for either understanding or senseless violence and then twists them up through increasingly unlikely mistakes into the worst-case scenarios until it ends with inadvertent carnage. The concept is funny and startling, but it wears out its welcome ever so slightly. It grows repetitive and more than a little predictable. But because Tudyk and Labine are so very charming and inherently likable, I remained involved in the increasingly harried plight of Tucker and Dale’s ill-fated vacation. Besides, it’s hard not to care when there’s some pathos to be found in the way that Dale has internalized the way society sees him, especially when he tells the girl they rescued that the whole situation they’ve found themselves in is his fault. “I should have known if a guy like me talked to a girl like you, somebody would end up dead,” he says. He and the filmmakers are fighting for the little guy arguing, however crudely and simply, that caricatures are people too. This is the first in an intermittent ongoing series in which I'll be catching up with some films from 2011 as we begin the end of the year. An insane asylum can be a great setting for a horror movie, especially one doubling as a period piece. Straitjackets can be creepy enough, but when you add jolts of painful electroshock therapy and sharp, swift lobotomies, the whole atmosphere of the place is downright threatening. Rarely are we relieved of these threats, put in the shoes of the doctors and nurses. We’re always right there with the inmates, struggling against the ever-present struggle between sane and insane. This is the location of The Ward, John Carpenter’s return to the big screen after a decade of absence. Once upon a time – the 70’s and 80’s – he made with great classicism and terrific style some of the most memorable horror films around with Halloween and his remake of The Thing, even his silly-but-creepy killer car flick Christine. The Ward isn’t exactly a return to form, it’s not good enough for that, but it’s still refreshing to see him working again. A fine group of young actresses portray the inhabitants of the 1960’s ward that serves as the film’s claustrophobic setting. As the story begins, a runaway turned arsonist (Amber Heard) is carted into the place deeply convinced of her sanity. The other girls (Mamie Gummer, Danielle Panabaker, Laura-Leigh, and Lyndsy Fonseca) are sure she’s crazy, just like them. Why else would they all be here? They sit under the stern, watchful eye of clichéd mental hospital employees, the stern nurse (Susanna Burney), the brutish orderly (D.R. Anderson), and the mysterious doctor (Jared Harris). It’s awfully strange that the inmates seem to be disappearing one by one at the hands of a ghost and the staff doesn’t want to talk about it. Creepier and creepier. Unlike his earlier work, Carpenter has less of a sole responsibility for this film, serving as only director, working from a screenplay by Michael and Shawn Rasmussen. As director, he brings his precise visual sense. It’s not as refreshingly classical as one might hope. He amps up some of the moments with some of the standard visual tricks and gimmicks of modern horror. The camera moves more than his past work, but the editing within the shots often remains refreshingly restrained and tightly controlled. When the camera does slow down, even stops, there are impressively static compositions that allow characters to move within them. A scene in the common room of the ward in which the girls decide to bounce around to a record playing gains a quiet tension through the patience with which it unfolds. On it’s surface, the scene has no overt scares, but it has a sneaky build beneath the ordinary. It’s a movie that works best in moments like those, when the ordinary operations of the ward are allowed to simply happen. A patient coolly refusing her medication, a doctor calmly discussing therapy, inmates sitting around talking, these simple moments become the stuff of creeping unsettling. When the ghost shows up, it’s often the kind of gotcha jump scares that caused my heart to leap but then almost immediately settle down, as I felt a small measure of sheepishness for falling for such tricks. That’s the essential nature of the film, scary in the moment but it just doesn’t stick. For all its patience, it’s also kind of predictable. And that twisty conclusion’s a bit of a cheat isn’t it? I hope this is an example of Carpenter stretching his artistic muscles, getting back into the kind of shape that will lead him to once again direct a great film. This is more or less a good B-movie (more like a B-minus), but in the end it’s as inconsequential as it is promising. The Ward is now available on Blu-ray and DVD. Baseball may be a sport, but Moneyball is not really a sports movie. To be sure, it’s based on the book by Michael Lewis about the modestly budgeted Oakland Athletics’ 2002 season in which, against the objections of manager Art Howe, their general manager Billy Beane tried out an untested new method of signing players, focusing on statistics more than stars. It was a risky gambit of the kind that makes or breaks careers and, assuming you may not be knowledgeable about recent baseball history, I wouldn’t dare think of telling you the outcome. Though this movie covers the territory of men trying desperately to eke out enough wins to contend for the championship, though it follows training, strategizing, and yes, even some Big Games, this is not a sports movie. It’s a movie about business. Major League Baseball is a multi-billion dollar business. It’s America’s pastime, and we love to pay for it. The crux of the film is the Athletics’ budget. As a team, they are dramatically outspent by bigger, more financially flush teams like the New York Yankees and the Boston Red Sox. What Beane decides to do is to hire a recent college grad, a Yale economics major to be precise, to crunch the numbers. He, composite character Peter Brand, is a nice, pudgy guy who has never played baseball but loves the number game. He tells Beane that they shouldn’t be focused on buying players, but instead to focus on buying runs. He pours over tapes, analyzes the data, and is confident that he can identify underestimated, and therefore undervalued (and thus affordable) players. Beane is played by Brad Pitt as a driven man with a desire to do right by his team, but there’s a part of his initiative given over to bucking baseball’s conventional wisdom. We see Little League pictures of him proudly wearing an A’s hat on his sandy blonde hair. We learn that he signed a Major League contract right out of high school, but that his career didn’t pan out. So maybe he has an all-too-personal understanding of the difference between skill and potential, about the damage under- and overvaluing players can do to a team and its members. Maybe there is some of this underdog spirit to his decision to hire the sweet, serious, and shy Brand (a character played quite nicely by Jonah Hill), and in his agreement to find players that no one else wants, like a catcher (Chris Pratt) who can no longer throw, and find new life for their careers. His underdog spirit carries over into the A’s organization, where Beane finds himself butting heads with the team’s longtime scouts and the recalcitrant manager (Phillip Seymour Hoffman). 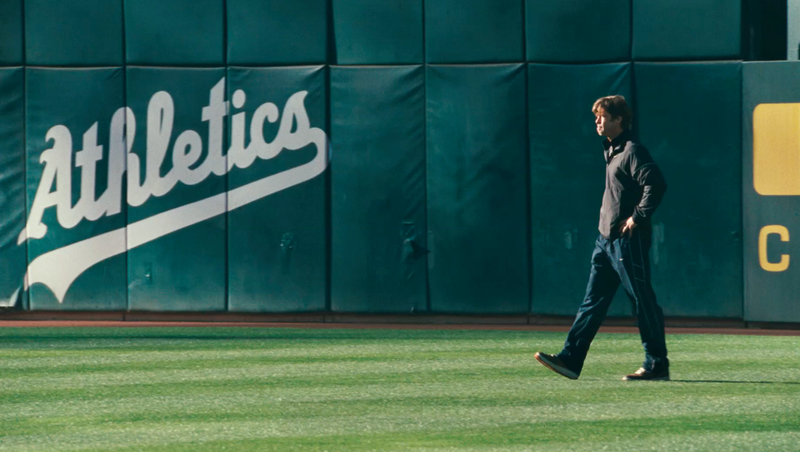 Moneyball is at its best when it’s a movie about men at work, about people forming partnerships and rivalries along the basis of their business philosophies as much as true friendships, which are forged in the fires of professional camaraderie. This is not a movie with notable female roles, aside from a couple sweet scenes between Beane and his daughter (Kerris Dorsey). This is not even a movie that follows closely too many baseball games, though that makes the ones that are so very satisfying. This is a movie with its most suspenseful scene one of a telephone call with two men in one office negotiating player trades. The script, which was written by Steven Zaillian and Aaron Sorkin, balances the romance of baseball, the pulse-quickening athleticism and the leisurely pace, with the eggheaded tables, graphs and charts of its endless stats. Is there any other sport so beautiful and so wonkish, so skillful and so nerdy? There’s a tension between the themes that is pleasantly dissonant. The film comes from two terrific screenwriters and sometimes I could feel the uncomfortable tension between their approaches to the material, or maybe I was just trying to pin down blame for why I felt the film a little lumpy, pokily paced and overlong. But director Bennett Miller, of Capote, smoothes things over with his resolutely unshowy visual style, which serves to call attention to the small, likable moments the actors bring out of the well-written scenes. Those scenes are hit out of the park, but the rest of the time I was merely interested, not involved. I was expecting a great baseball movie, a real home run, but what I got was a nice, solid base hit of a middlebrow drama. The movie tries to make Taylor Lautner, the werewolf from the Twilight movies, into a star capable of taking center stage. He stars as Nathan, an average, if a bit on the wild side, teenager who discovers that a childhood picture of his is on a missing person website. Soon, two goons show up at his house and kill his parents (Jason Isaacs and Maria Bello, putting in little more than cameos) who, before they died, confirmed that they aren’t his real parents. Then one of the goons spits out a dying warning. “There’s a bomb in the oven.” Kaboom. The house blows up sending the fleeing Nathan and his study partner (Lily Collins) into the backyard swimming pool. They run to a nearby hospital where they call 911. “Are you okay?” the operator asks. “A little shaken up,” he replies. Talk about an understatement. Somehow Lautner finds an unconvincing way to play rattled. He’s a pretty young man who, in his best moments of acting in the film, invites a similar amount of sympathy as a whining puppy. The plot thickens around him as the hospital fills up with dangerous people who want to attack him for some reason. Alfred Molina barks from a CIA control room while Michael Nyqvist stalks the halls with his vaguely villainous henchmen. Luckily Sigourney Weaver shows up to drive the teens to safety, claiming that she’s a friend of Nathan’s real parents. It’s all so very convoluted that she can hardly explain it to them, practically shouting that both men are up to no good but for separate and competing reasons, so trust no one. Then she makes them jump out of the moving vehicle. Director John Singleton, an Oscar nominee whose recent career choices, like Four Brothers and 2 Fast 2 Furious, can be charitably described as belonging to a slump, keeps things zipping along painlessly enough, I guess. The screenplay by Shawn Christensen is a jumble of semi-nonsense. It’s the kind of movie where computers are magic boxes that can do anything required of the plot with just a few keystrokes, characters suddenly possess knowledge they couldn’t possibly have gained, and a bomb can mysteriously appear ready to blow up inside an oven and destroy an entire building. To say the movie has a few plot holes would be an understatement. Between the creak of cliché and the whiff of straight-faced, unintentional silliness, the best we can really hope for is watchable. It’s almost there, but for the fact that the talent just isn’t into it. Singleton may be coasting on competence in the direction department, but it’s the cast that really assists the film in sinking to the level of its script. Lautner’s trying his hardest, at least I think he is, and Isaacs and Bello are fine in their brief moments on screen. It’s Molina who seems inert, Nyqvist who seems distracted, and Weaver who has a curiously flat affect. Or maybe they think they’re in a comedy? Abduction may have been intended to be a ludicrous teenybopper distraction and a potential star-maker, but in reality it’s just a nice paycheck for a bunch of folks who deserve better. Watching it is painless and useless in the same proportions. Like a meticulous Jean-Pierre Melville thriller filtered through the glowing unrequited romance in isolation of Wong Kar-Wai and the dark neon criminality of Michael Mann, Nicolas Winding Refn’s Drive builds its tension slowly by piling simple, stylish scenes upon each other. As you can probably tell by the variety of filmmakers I referenced just to begin to get at a description of the film’s style, Refn is primarily concerned with the look, the feel, and the mood of his film. It’s awash in striking lighting, soaking in a synthy score, marinated in an 80’s genre feel with some 90’s neo-noir baked in. It’s a hollow genre exercise, living on nothing but its trance-like sensation of danger around every corner. But what a sensation! It’s hollow, but exciting and welcome as well. The film stars Ryan Gosling as a man who drives. He’s a stunt driver for the movies and a getaway driver for hire. Both jobs he procures through his boss (Bryan Cranston, made leaner and more dangerous by the tremendous Breaking Bad), a mechanic who owns a small garage. As the movie begins, we follow Gosling through the process of preparing for a robbery. On a disposable cell phone in a darkened room, he agrees to be parked outside a particular target at a certain time, giving his unseen clients a five-minute window. He arrives. He parks. To the steering wheel, he straps his watch, its ticking ratcheting up the tension and mingling with the sounds of a basketball game on the radio. Finally the clients, armed, wearing black masks, and carrying suspicious duffle bags, rush out and get in the car, fleeing ahead of an alarm. Then, Gosling drives. After this brilliant, focused introduction to the world of Drive, we settle into a quiet rhythm that establishes with slow-motion lens flares, 80’s aping song choices, and ample silence and solitude the life of the driver. He has few attachments. His boss, though, has connections to a pair of goofily menacing low-level mobsters, a cheapo movie producer (a threatening Albert Brooks) and a pizzeria proprietor (a darkly funny Ron Perlman). The Driver, on the other hand, appears to live simply for the chance to drive. He talks with his boss in shy, boyish tones, and then switches into clipped, matter of fact speaking when he commands his clients, walking them through his rigid rules for helping them escape the law. It’s an empty life, but a simple one. He seems comfortable, never more so than when behind the wheel. But before too long, there’s a complication. There always is in films of this sort. A comfortable criminal existence can never remain so. The complication in Drive patiently emerges and develops. I had managed to shield myself from the downpour of hype for the film that started in Cannes and continued in a trailer that reportedly gave away the bulk of the plot. I had no idea where this ride would take me and that’s a part of the reason that I found it so successful. (If you want to remain similarly shielded, go ahead and skip the next paragraph). The Driver grows close to his neighbors, a young mother (a sadly underutilized Carey Mulligan) and her small son (nice, natural Kaden Leos). They spend time together. He helps her out, fixes her car and gives her rides to work. Then her husband (the terrific Oscar Isaac) comes back from prison. Rather than falling into the expected, with a jealous ex-con filled with anger towards this suspiciously helpful neighbor, the husband thanks the Driver for helping out the family during his absence. Later the man asks the Driver to assist him (and a glum beauty played by Mad Men’s Christina Hendricks) with a pawnshop heist, a job that will pay his mob-owed debt and protect his wife and son from certain danger. The Driver agrees to help. But all doesn’t go as planned. Complications pile on complications and, though brief blasts of chaos puncture the best-laid plans, the film’s style never loses its cool. Characters are observed in action, or more often inaction, vivid embodiments of tightly coiled potential. By the time this exercise in cool and quiet style explodes into gobs of gory violence that are over before you even have time to fully register what you’re nearly retching at, the film has had an undeniable visceral impact. Refn uses his characters as a means to an end, to satisfying his stylistic goals. They’re spare and simple uncommunicative beings, genre types boiled down to their purest embodiments, characterized by the gaps and silences in the storytelling. Gosling’s driver cares for the girl next door and wishes for the safety of her child. He likes to drive – he’s a great driver – and thinks that he can help her by using his talents. But who is this nameless driver? Who is this woman? Who are these criminals? Refn doesn’t seem too terribly interested in answering those questions. (To be fair, the script by Hossein Amini, from a novel by James Sallis, doesn’t provide the answers either). Characters exist only to the extent that they facilitate the action and the mood. This is a film that grooves on its artful tension, its twisting dark plot, and in its focus on style as substance. I was captivated. It’s a sugar rush, a contact high, and an absorbing, disturbing experience. The screen is dark. The theater is silent save for one ragged cough echoing in the speakers. Suddenly the screen comes alive with a cut to a clearly ill woman – puffy red eyes, pale skin – sitting at an airport bar talking on her cell phone while rummaging in a small bowl of complimentary peanuts. She coughs again. She’s tired. “Jet lag,” she says. “Day Two,” an ominous subtitle announces. It has already begun. This is the opening of Contagion, the newest film from Steven Soderbergh. It reteams him with screenwriter Scott Z. Burns who wrote his corporate espionage comedy The Informant!, but there’s nothing funny about their new collaboration. Closer in spirit, if not depth, to Soderbergh’s drug-war epic Traffic, Contagion soberly, seriously, and single-mindedly portrays a global pandemic. It starts with a new strain of a disease, deadly variations on common ailments. Once infected, a person is contagious without knowing it, spreading it to those nearby. Then, flu-like symptoms set in. Then come the seizures. Then, all too often, comes death. By then, there are already more people to count among the growing numbers of the infected. It all starts with the woman (Gwyneth Paltrow) in the opening scene. She’s returning home to Minneapolis from a business trip to Hong Kong. Her husband (Matt Damon) and her son (Griffin Kane) are concerned about her, as her symptoms grow ever increasingly worse. A film of massive scope starts small, with this little family unit, but grows larger and larger as the virus makes its way across the planet. We meet scientists (Jennifer Ehle, Elliot Gould, Demetri Martin) tasked with analyzing the disease that has suddenly appeared in Minnesota. Could it have a connection to the mysterious ailment that is affecting certain villages in China? And now there are reports of this strain in London, in Hong Kong, in Chicago. Who came into contact with this one sick woman who happened to cross the globe, who infected her and where did they take the infection? Or is she the source? The disease spreads. The ensemble grows. At the Center for Disease Control, urgent meetings are held. They’re in contact with the scientists, but no one seems to be able to say for sure what is happening. Laurence Fishburne sends Kate Winslet to Minnesota to investigate what they have taken to calling “Ground Zero.” Overseas, the World Health Organization sends Marion Cotillard to Hong Kong, where they’re working with their own leads. All want to understand this ailment, so that they can cure it. Contracting the disease is not quite a death sentence – some of the sick do survive – but it’s close enough. Everywhere the cameras turn, there are new characters to puzzle through the mess with us, a general (Bryan Cranston), bureaucrats (Chin Han and Enrico Colantoni), even a confident conspiracy theorist (Jude Law) who sees it all coming, posting a viral video of a Chinese man collapsing on a bus, all the while ranting about evil pharmaceutical companies and pure natural remedies. But for all his sense of righteous certainty, he’s no more capable of stopping the pandemic than the ones in power that he castigates. For all the explanations, the crinkling scientific dialogue and the pulsing montages, the essential source of fear remains elusive. It’s essentially a zombie movie without the zombies. Death is slowly, relentlessly coming. You can hole up, you can hide, but it will inevitably arrive. There’s an invisible source of creeping dread that could infect you and kill you, but not before you spread it to your family and friends. It’s a slow motion freak-out. Soderbergh pays attention to the surfaces we come into contact with on a daily basis. Buttons, knobs, handles, and counters become simple sources of anxiety. He holds the camera an extra beat when someone presses against a door, or punches information into a computer. No one has to speak the word “germs” to start the unsettling sense of grim distress. By the time the world is in a full-blown panic over the pandemic, rioting, looting, protesting, worrying, the germs are only part of the problem. The characters are moved about as pawns in the cold what-if scenario, this pandemic epic. It’s an extraordinary cast, movie stars expertly deglamourized and not at all safe, but the disease is the real star. This holds the movie back to a certain extent, keeping the characters at a slight distance, as it spends its time reveling in the nuts-and-bolts of its elaborately staged outbreak while allowing the human element to stretch thin. The film doesn’t seem too concerned with depth of character, though. It’s really only out to send shivers into audiences with its sole meticulous purpose to put out a chilly, convincing bio disaster scenario. Soderbergh uses his considerable skills as a filmmaker to create a fast pace and a believable atmosphere, effortlessly cutting between the dozens of characters and locations, juggling perhaps too many plotlines. His camera stares with cold hues and unblinking detachment at the dead bodies, the computer screens, the press conferences, the roundtable meetings, and all those potentially deadly shared surfaces. It’s all too real. It doesn’t have a satisfying ending, but how could it? It doesn’t resolve so much as coast to a stop, but the journey there is terrifying. This is not a movie for hypochondriacs. It drives forward with nothing more to do than feed on the fear of contagion. It’s effective and persuasive, unadorned with obvious embellishment. I’m not often inventing symptoms, but that’s what I was doing while watching this film. I found myself shifting in my seat, my popcorn untouched, keeping my hands away from my face as my throat grew scratchy and I fought the urge to cough. With Kevin Smith’s films it’s always one step forward, two steps back. He’s an auteur utterly incapable of growth along any satisfying career trajectories. There’s a reason why he’s far more beloved for his speaking tours and podcast appearances than for his actual films at this point. Whatever charm he has live and in person – his skills as a conversationalist are considerable – is missing from his finished products. I’ve grown exasperated with him, turning up for each film and finding less and less of what I wish to see, namely a fully enjoyable experience. His 1994 debut feature Clerks, a simple, crude, and cheap black and white affair shows such promise without, you know, being a good movie, that its strange to see a director forever moving sideways. His talent has curdled. An early sense of precociousness has become precious, self-satisfied, and over-written, one talky comedy following the next. Even films like Chasing Amy and Dogma, his relatively more ambitious attempts to brush up against his own emotional or religious truths, come burdened with dialogue that registers to my ears as utterly false. Smith commonly claims to be far better with dialogue than with visuals. There’s some truth there. His visual sense is strictly perfunctory, impersonal, where his writing drips with his personality. But at least his visuals are not as mannered and stylized as his dialogue which is so flatly similar across every character that to watch a Kevin Smith movie is to experience a cast of puppets all speaking in his voice. With Red State, though, he shakes things up. He’s attempting to get back to the kind of scrappy indie potential that his filmmaking hasn’t shown in almost twenty years. This isn’t a talky comedy; it’s a talky horror thriller. Three teen guys (Michael Angarano, Nicholas Braun, and Kyle Gallner) drive out to a remote house in the woods where they think they are to find a woman (Melissa Leo) that they met online. In person, she’s older than they expected and her motives are darker than they think. 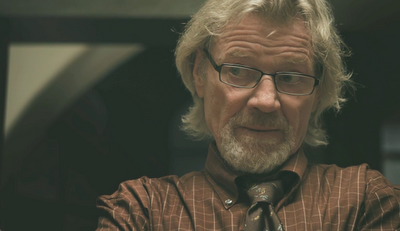 She drugs them and hands them over to the leader of a cult, a creepy, charismatic preacher (Michael Parks). The film pauses to regard this lanky, grizzled man as he delivers to his congregation a lengthy homophobic sermon that culminates in his murdering a bound gay man on the altar while the three teens shiver in a cage nearby. This is all adequate sloppy scariness, unsettling and squirmy. It’s not typical Smith, visually static and uninspired. I particularly liked a shot in which a church-basement’s gun closet slowly reveals its contents as a cross-shaped fluorescent light flickers to life overhead. Smith’s camera jumps and leaps with similarly disrupted editing. As the teens attempt to escape and get caught up in a bigger calamity, the story Smith tells takes wild, provocative leaps in tone and content. His characters speak in distinguishable dialogue, giving a chance for individual actors to stand out, like when John Goodman thunders onto the scene as an ATF agent who gets pulled in to investigate. Moving around the margins are less successful caricatures that are of little use for the film, like a buffoonish sheriff (Stephen Root) who seems to be only a pawn for Smith’s larger political aims, a satirical intent that never fully materializes. Smith is trying so much new here. The film is as alive with promise as anything he’s ever done. And yet, and yet, this still isn’t a good movie. When it debuted at Sundance in the middle of a Smith-fueled media-circus, the critical condemnation was swift and furious. He called the film a game-changer, a film so good he felt ready to retire, but this haphazard mess is anything but a game-changer. It’s a radical departure in style and tone for Smith but it’s not any better a horror film than his other films are comedies. Its wild leaps feel schematic when they come to land; the twists are harsh, flippant rug pulling and mindless blood lust. The film’s potential slowly drains away so that by the end it feels like its been written, manipulated, into a corner from which only a shrug can escape. What makes Red State particularly disappointing is the way it’s so close to being Smith’s best film, and yet so terribly far away. It’s a film that sets out to skewer unquestioningly held beliefs that is ironically preachy and ultimately only satisfying for audiences already initiated into the cult of Kevin Smith. The appeal of Shark Night 3D is exactly at the level of watching attractive twenty-somethings walk around in bathing suits before getting devoured by special effects. It comes advertised as a PG-13 horror movie about college kids spending some of their summer at a remote beach house on a lake that is suddenly and confusingly full of sharks. You certainly can’t fault the movie for false advertising. Director David R. Ellis brings us another horror movie cut like an action flick. His Final Destination 2 and even Snakes on a Plane benefit from the eventful buzz, the constant propulsive tension that he brings. (It’s no wonder that his best film is Cellular, his only pure actioner). In Shark Night 3D, as soon as college girl Sara (Sara Paxton) arrives in Louisiana with a group of vacationing college clichés (Dustin Milligan, Katharine McPhee, Chris Zylka, Alyssa Diaz, Joel David Moore, and Sinqua Walls) in route to her parents’ lake house, they get in a choppy boat chase with the scruffy local police officer (Donal Logue). They’re not in trouble; he just likes giving kids a hard time. Now that the screenplay from Will Hayes and Jesse Studenberg has established that this group of young people are staying in the middle of nowhere with only a goofy cop to watch out for them, it’s time for the sharks to start attacking. The sharks show up with all the regularity of action sequences and are shot in the zippy action style that the early boat chase sets the pattern for. The first victim is bitten while water skiing, sending the others into a bit of a panic. The attacks continue, escalating in their scope. It’s not long before a shark collides with a boat sending it malfunctioning into a dock where there is a large explosion that sends debris flying towards the audience. The victims’ attempts to fight back or flee are presented in visually expansive ways. This is no close and creepy horror thriller. These people are trapped in the expanse of wilderness where you can attempt to flee by Jet Ski but you might not get very far. In addition to the sharks, the college kids are creeped out by skeevy locals (Chris Carmack, Joshua Leonard, and Jimmy Lee Jr.) who are incorporated into the chomping story quickly enough. The sharks in this movie are awfully stubborn things, leaping out of the water or swimming great distances just to bite someone. This being a PG-13 movie, their snacking just turns the water red, but there is enough quick-cut visceral impact to make quite clear the fate of these poor pieces of shark bait. There’s not much to the movie, when all is said and done. It’s nothing more than a delivery device for attractive performers, low-level thrills and modestly effective B-movie baloney. There are some fun spills, some vaguely likable caricatures, and a handful of enjoyably predictable beats, nearly everything an earnest, underachieving, 30-years-too-late Jaws rip-off could be. The filmmakers didn’t set their goals very high and therefore managed to meet them. As a last weekend of summer time waster, it’s not entirely terrible. It’s not, strictly speaking, good, but “not entirely terrible” felt just good enough at the time.